Madhuri Dixit Nene, who is making her acting debut in Marathi cinema with Bucket List, says doing a film in her native language was always on her wish list. “My bucket list is always expanding. I like taking up challenges and once it ends I take up new challenges, so it never ends. Doing a Marathi film was on my bucket list. “Marathi cinema is in its golden phase. Such good subjects, technically they are so good. It was one of the biggest things on my bucket list that I have crossed out,” Madhuri told reporters here at the trailer launch of the film last evening. Madhuri made her acting debut with Abodh in 1984 but it took her over three decades to star in a Marathi film. “I was waiting for the right Marathi script to come my way. This is a great story. It is about everyday women and how she gets lost. She forgets who she is as she does things for her family. When she gets on this journey and tries to complete a bucket list of someone else, she finds herself. “I was a housewife for a brief period and they all go through this. I think they all would relate to this,” Madhuri said. 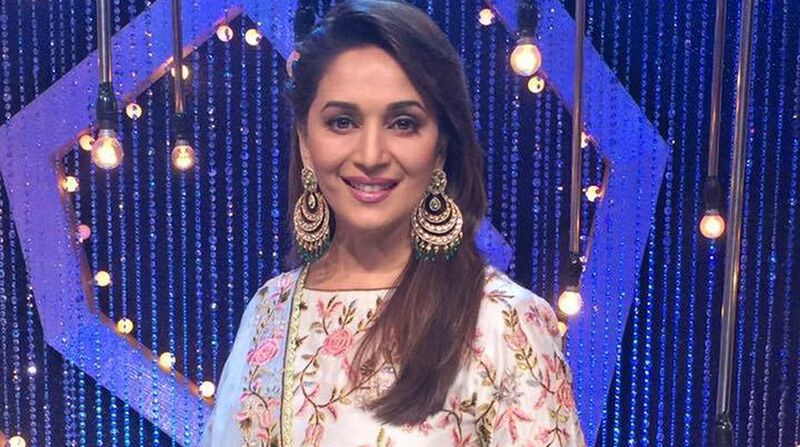 With this film, Madhuri has again collaborated with her “Hum Aapke Hain Koun” co-star Renuka Shahane after a gap of 24 years, and with Ranbir Kapoor, who has a guest appearance in the movie. “It was wonderful working with both of them. I first met Renuka on the sets of ‘Hum Aapke Hain Koun’ and we got along immediately. We both are from Maharashtra and had the same cultural background. I was happily working with her again. Our relationship is different in this film. We share an emotional bond in this film. “Ranbir is one of my favourite actors. I appreciate his work. We had a great time. He was gracious to do this film. He is a charming boy,” Madhuri said. Director Tejas Prabha Vijay Deoskar says the idea for this film came from an article that he read online a few years back and thought of developing it into a script. “I was working on it for two years or so and I wanted Madhuri in this film. I am glad she said yes,” he added. Actor Sumeet Raghavan, who is paired opposite Madhuri in the film, says working with her was a great experience. “When we talk about Madhuri, your eyes just become wide open and jaws drop. This was the same feeling when the director told me I am opposite Madhuri. It was a fan-boy moment for me,” Raghavan said. “Its been 30 years she is working but when we were doing scenes I never felt that she has so much experience,” he added. The film releases on May 25.